King Willem-Alexander and Queen Máxima of the Netherlands congratulate seven Dutch investigators who were appointed adjunct professors in Feinberg’s Department of Physical Therapy and Human Movement Sciences. Photo by Nathan Mandell. 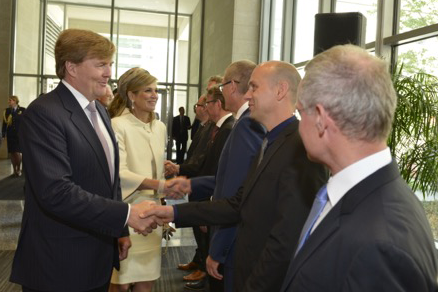 Northwestern University Feinberg School of Medicine welcomed King Willem-Alexander and Queen Máxima of the Netherlands June 3 for a special ceremony announcing research collaborations between Northwestern University and three universities in the Netherlands focused on the study of healthy aging. Northwestern Provost Daniel Linzer began the ceremony by welcoming the royal couple and a delegation of Dutch diplomats and academics to Feinberg, and thanked them for their commitment to further research on healthy aging. Queen Máxima of the Netherlands and Jules Dewald, PhD, chair of Physical Therapy and Human Movement Sciences, arrive at the Robert H. Lurie Medical Research Center. Photo by Nathan Mandell. Following the ceremony, the royal couple and members of the Dutch delegation met with top Northwestern scientists to discuss the latest advances in healthy aging research. Vadim Backman, PhD, Walter Dill Scott Professor of Biomedical Engineering at Weinberg College of Arts and Sciences, shared his research, which links biophotonics and cancer research. Sandra Weintraub, PhD, professor in Psychiatry and Behavioral Sciences and Neurology, along with Marsel Mesulam, MD, director of the Cognitive Neurology and Alzheimer’s Disease Center and professor in Neurology, presented their research on Alzheimer’s disease prevention and early detection. Jules Dewald, PhD, chair of Physical Therapy and Human Movement Sciences at Feinberg and organizer of the visit, along with Barry Hes of Motekforce Link, a Dutch rehabilitation technology company, shared a prominent example of collaboration between academia and industry on the development of rehabilitation devices based on scientific advances. Dewald and his team are already seeing the benefits of collaboration with the Netherlands. They have begun work on two European grants with researchers at Delft University of Technology and the University of Twente, focusing on high-resolution brain imaging and robotic rehabilitation device development. Dewald’s work on these grants helped prompt the visit and other research partnerships with the Netherlands. Jules Dewald, PhD, chair of Physical Therapy and Human Movement Sciences, demonstrates a rehabilitation device for King Willem-Alexander of the Netherlands. Photo by Nathan Mandell. During the visit, King Willem-Alexander and Queen Máxima also witnessed the appointment of seven Dutch researchers as adjunct professors in the Department of Physical Therapy and Human Movement Sciences at Feinberg. “Through these partnerships, we are creating a transatlantic bridge between Northwestern and top research institutions and industry leaders in the Netherlands, which is known for sophisticated development of technology and state-of-the-art medical research,” Dewald said. The visit is a Northwestern homecoming of sorts for King Willem-Alexander, who spent three months at Northwestern’s Kellogg School of Management in 1997 in the Executive Development Program. The royal couple’s visit is part the their tour of the United States to promote research collaboration and economic partnership around healthy aging. Their website contains more information about their visit.